Welcome to Facebook Fridays! for May 2, 2014! Keep your funds in your pocket and bank account for nest eggs and high priorities! 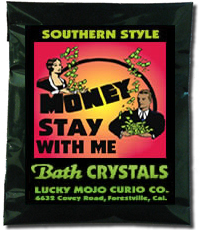 The Lucky Mojo Curio Co. is hosting a random drawing to give away 4 different Money Stay With Me spiritual supplies to get and hold onto your money. 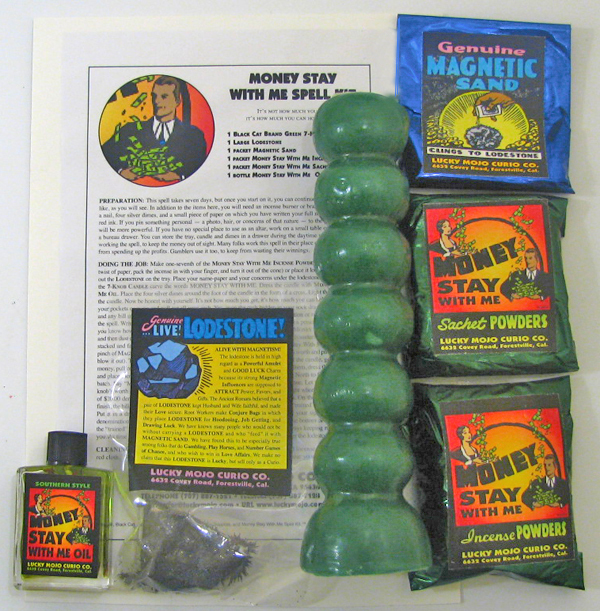 This week 4 lucky winners will receive a Money Stay With Me Spell Kit, a Money Stay With Me Mojo Hand, a Money Stay With Me Oil, and a packet of Money Stay With Me Bath Crystals. All you have to do to enter is to go to the Lucky Mojo Facebook page, scroll down, and post a comment to the Facebook Fridays! status message for May 2, 2014. First thing tomorrow morning, we will select four winners at random, announce their names here, contact them via Facebook to get their mailing addresses, and send them their FREE Money Stay With Me products. We have a winner! In fact, we have 4 lucky winners! Our Facebook Fridays Giveaway winners for May 2, 2014 are: Julie Garrett, Derek William Eldridge, Aleta Walsh, and Alexander Ramirez.